We jumped off the dive boat from Evolution Dive at Malapascua Island at about 6:15 in the morning. We had enjoyed a glorious sunrise during the half-hour ride to the site, interspersed with cool showers as the breeze picked up the spray from our boat smacking through the waves. We were running a little late; most of the boats from other resorts were already there and their divers already down. Our boat pulled up a few yards downwind of the other boats. There is no anchoring here; our divemaster Shelagh (an American from New Hampshire) told my buddy and me it was time to jump. We had all done this before, so the entrance was quick: A jump, a splash. Wait a minute for everyone to be ready, and down we go. It may have been morning above, but underwater it was still dim predawn — light enough to see, but still gloomy as we neared the rubble reef top of Monad Shoal. Monad Shoal is a sea-mount, the top of an underwater promontory that rises from the surrounding depths. Big pelagics like the sought-after thresher shark come here in the early morning to be cleaned by reef fish; they are all gone by an hour after sunrise. Divers enter near the center of the shoal then swim gently along the reef to take up watching positions near the end of the mount, where thresher sharks are most often seen. There were no other divers around our little group as we descended easily to the shoal-top reef, about 60 feet below. As we approached the bottom, Shelagh stopped and hovered, pointing into the gloom. My buddy and I weren’t yet to the bottom when it appeared: A large thresher shark came out of the gloom, swimming directly to us. We froze in place. 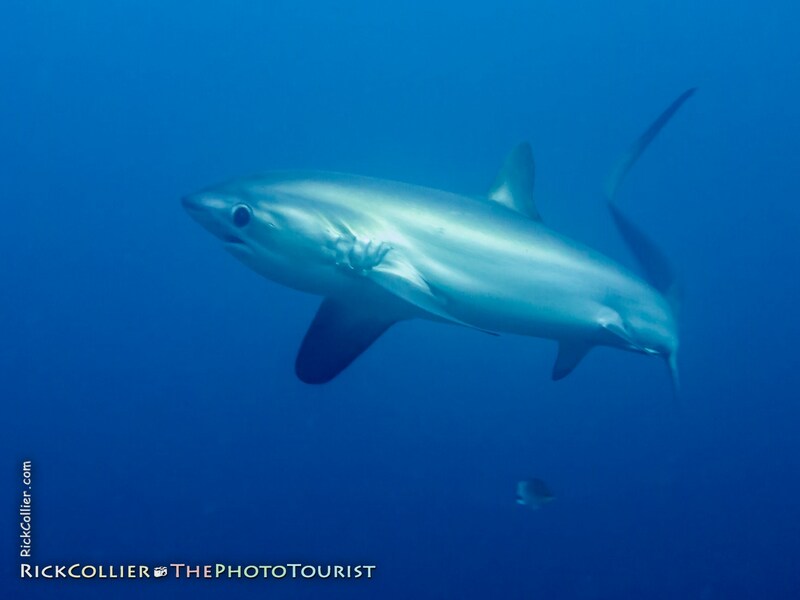 Thresher sharks are notoriously shy; one sudden move, and our visitor would be gone more quickly than it arrived. Our “friend” cruised slowly past our little group, seemingly near enough to touch. Then it turned and came back. It circled us lazily once more — then, curiosity satisfied, it was gone. We were amazed at our encounter; that never happens. We were in the center of the shoal, nowhere near the normal viewing area, and we were alone. It was like the sea decided to bless us with our own, private visitation. After that, the rest of the dive was ordinary. We made our way gradually to the area where all the other divers waited; there we carefully hovered in place a foot or so above the reef, hoping for another sighting. We kenw that whatever came, it would not match what we’d just seen. We had no more fabulous thresher close encounters that day; instead, I got to see first-hand why Monad Shoal is endangered and thresher encounters there are becoming less common. Divers were everywhere around us, lying on the reef and milling around like bored tourists — stirring up an enormous plume of brown muck to stream away into the ocean. Once upon a time, Monad was considered an advanced dive because divers were expected to manage their buoyancy and hover in place for the entire dive, never touching the fragile corals or disturbing the marine environment. Today, dive operators bring even new divers with poor skills; the divers are tourists who must be entertained. The reef is being killed by hordes of undisciplined and underqualified tourists. And operators pandering for their money. This entry was posted on Saturday, July 14th, 2012 at 18:05 PM. 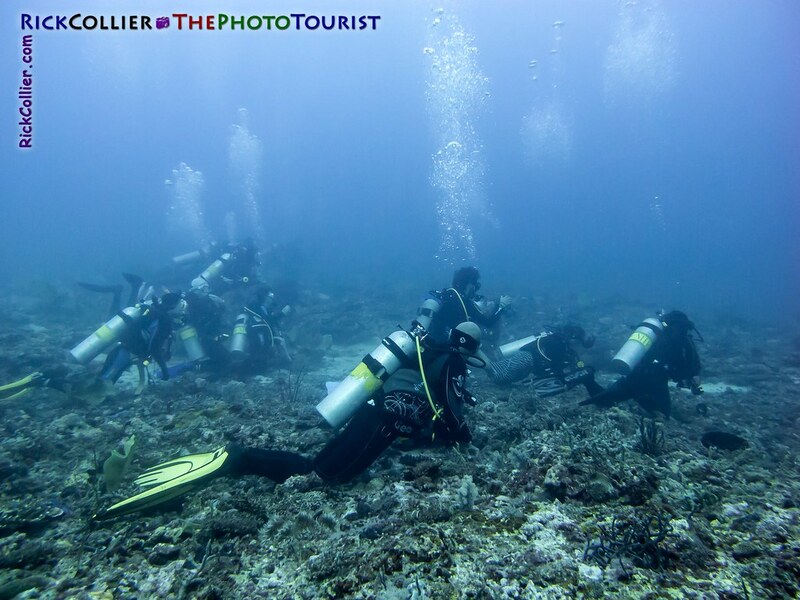 It is filed under thePhotoTourist, Underwater and tagged with damage, diver, divers, diving, island, Malapascua, Monad, Monad Shoal, ocean, pelagic, Philippines, reef, shark, shoal, thresher, thresher shark, Underwater. You can follow any responses to this entry through the RSS 2.0 feed. Love the pic – would love to see more of the Philippines! Thanks! Good idea … this blog has been languishing a bit while I worked on a big update to our Virginia Wine travel app (Virginia Wine In My Pocket). I’ve got more Philippines photos coming up soon! Cheers!